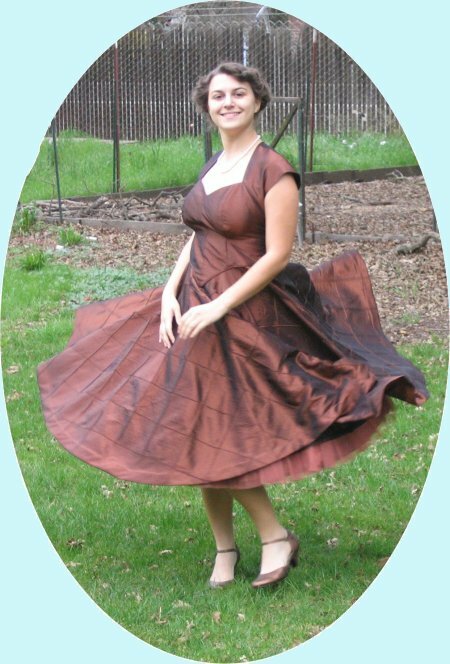 Way back when in the long-ago time (which would be circa late 1950's/early 1960's), my Mom owned a bronze taffeta dress with a coordinating bronze embroidered taffeta petticoat. I remember her wearing this dress to holiday family occasions. 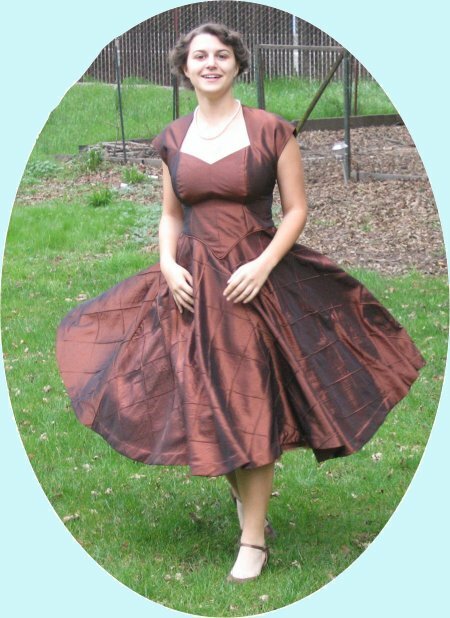 Because it was taffeta, it made that lovely "rustle" sound .. so luxurious! 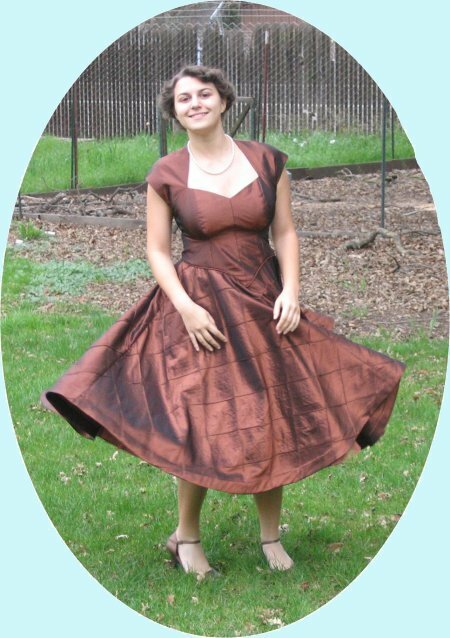 :-) I don't quite remember the specifics of the dress, being that I was so young, but the bronze taffeta stands out. Because Rene has been doing the social dancing the longest, I first offered to make her a dress to wear with my Mom's petticoat .. but she demurred ... it wasn't her style. Fair enough; I appreciated her honesty. I sure didn't want to go to the effort of making a dress for the petticoat if she didn't even like it. Much later on, when Lisa became involved in the same dancing scene, I repeated my offer and was very pleased when she accepted. 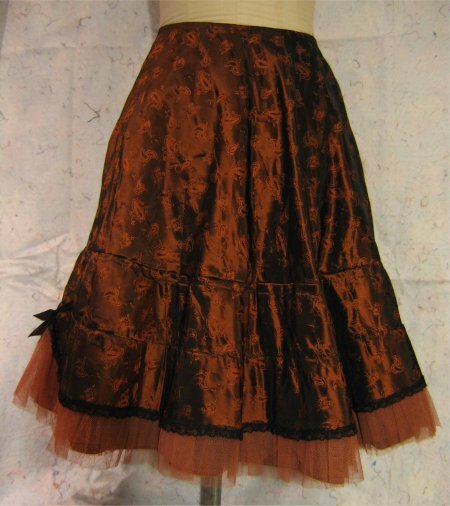 I found at Joann's, in the home dec section, some bronze taffeta that EXACTLY matched the color of the petticoat. Not only that, I found it in a plain (smooth) weave, a large-scale pin-tuck and a scrunched-up textured yardage. The large-scale pin-tuck was on the flat-fold table so that it was kinda/sorta a remnant .... it was as much yardage as it was and no more was available. It looked long enough to get a circle skirt out of it, so without knowing definitively if it was enough, I bought it. Then I looked through my pattern stash. My sewing background is garment sewing and I have a fairly extensive pattern stash. I found the *perfect* dress to make .. a sweetheart neckline and cap sleeves with a full skirt	.. not quite full circle, but very full. I remember buying this pattern back when but I was somewhat chagrined to discover that it is now considered "vintage" .. omigoodness, it's only circa 1988! After fitting the pattern on Lisa, I made the skirt out of the large-scale pin-tuck, making it as long as I could, given the fabric that I had. 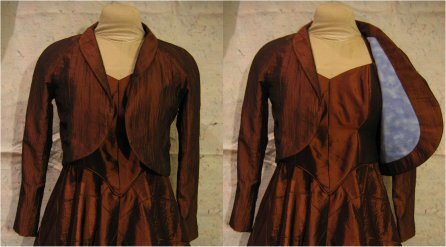 The bodice was made from the smooth weave fabric and the jacket was done in the crinkle texture fabric. I didn't like the way the pattern did the bodice finishing on the inside, so I altered it to be completely lined inside. I also added piping along the waistline seam, not only for looks but to strengthen the seam. To complete the 1940's look that she was going for, we tightly curled her hair in small sponge rollers after liberally spritzing her hair with hairspray. (This is a technique I learned from Rene's cheerleading days .. if you want curls that STAY, wet the hair down with hairspray THEN roll in curlers. Those suckers will last until the next century. :-) ) When the curlers were removed, we rolled her hair into a long, continuous roll along the hairline .. or as much as her short hair would allow us to. To our surprise, it turned out amazingly well. Lisa said the dress twirled beautifully at the dance. She was exceptionally pleased when two ladies came up to her complimented her on the outfit and *took her picture*! woo hoo! 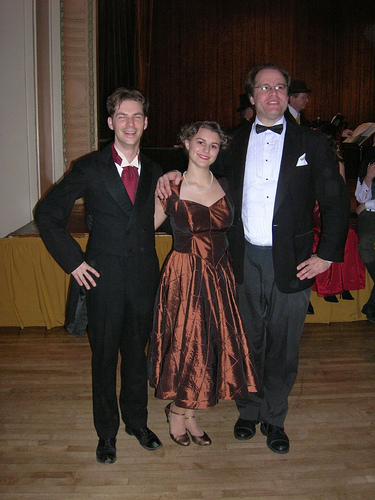 :-) Here, Lisa poses with two of her dancing partners.